Figure 8.15: A life cycle of a beetle. Notice how difficult it would be to identify the larva as an insect! 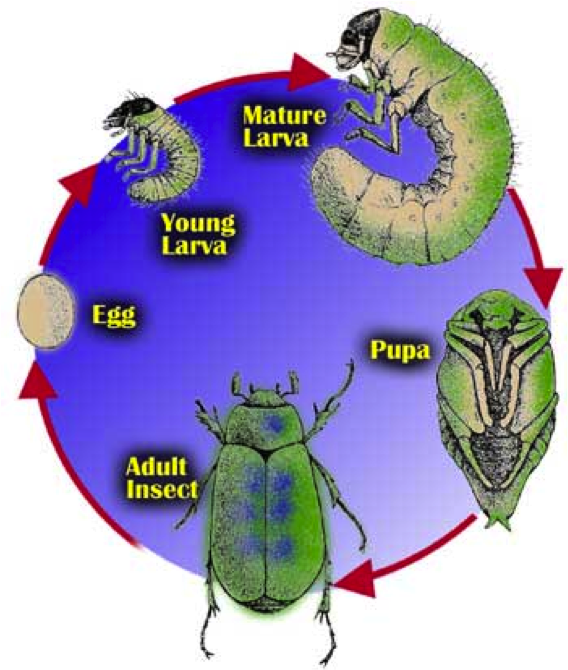 Insects with complete metamorphosis or holometabolous metamorphosis go through 4 stages: egg, larva, pupa and adult. Many larvae look nothing like the adults they will become: think of maggots and flies, or grubs and beetles, or caterpillars and moths. In fact, in Latin, the word larva means “ghost” or “mask.” This evokes the mysterious (and awesome) shift that takes place as the immature insect develops into an adult. Larvae hatch from eggs and go through a series of molts as they grow. The characteristics defining them as insects may be less obvious during those stages, or the characteristics may not be present at all. This makes them more difficult to recognize as insects. At some point the larva develops into a pupa. The pupa is often called the “resting stage” because on the outside, it appears that pupae don’t really do anything because they aren’t eating or moving. But, in fact, a lot is going on. Wings are developing, and legs, eyes, mouthparts and other larval structures are disintegrating and reorganizing into vastly different adult structures. The pupa then develops into the adult. Most insects go through complete metamorphosis including beetles, butterflies and moths, bees and wasps, caddisflies, and flies.